Over this pretty damn great year, our editors and friends consumed a ton of meals in messy whirlwinds of unfettered gluttony. But before doing that, they took some of the most beautiful (and literally tasteful) food photographs we've ever seen -- and we've seen your college roommate's Instagram account! 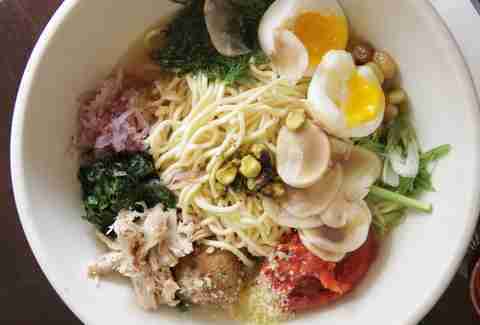 So, we compiled our favorites into this list for you to drool over. 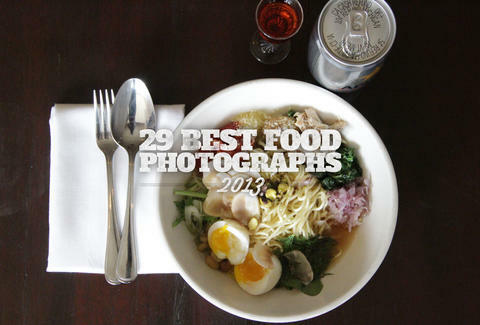 Here's our who's who of gorgeous food pin-ups from 2013. 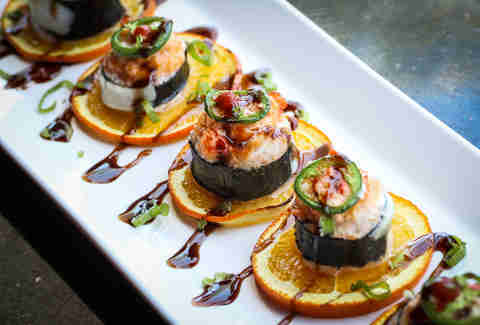 Spicy crab, spicy tuna, and cream cheese wrapped with white fish, topped with lobster and jalapeño, and baked with garlic-crab dynamite sauce. Pairs well with a 14min live version of the Phish song "Divided Sky". 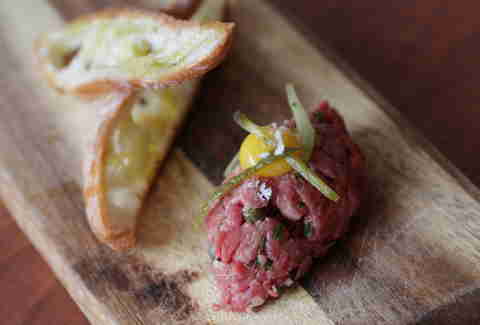 Raw steak, egg yolk, crusty bread, Catalan aioli. Not to be confused with steak tartar sauce, which might actually be good on this, now that we think of it. 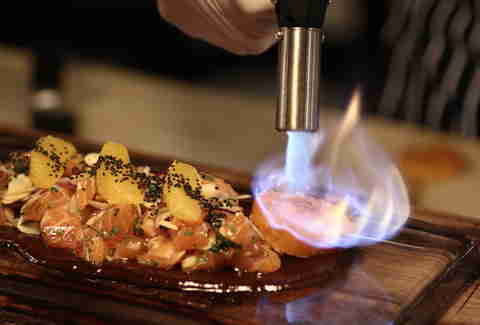 Salmon, shaved almonds, Thai chili oil, orange slices, sweet potato, totally badass flames. 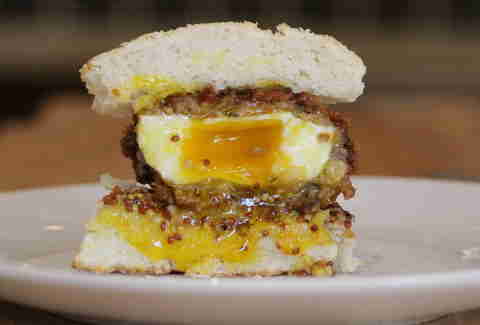 Biscuit, soft-boiled egg wrapped in sausage and deep fried, whole-grain mustard, cheddar. Scotch egg goes down, down into your belly. Deep-fried pigeon, Creole dirty gravy, pickled chilis, lettuce, tortilla. 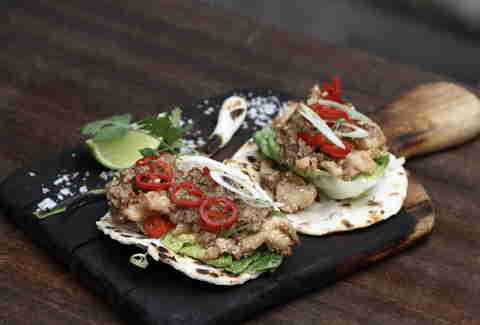 These tacos are just further evidence that most "dirty" things are actually awesome. Smoked short rib meatball, chili-marinated chicken, confit tomato, soft-boiled egg, pistachios, sautéed radish greens, pickled raisins, dill, Parmesan, red onion, bacon-infused broth. Served with Negroni shot and Sapporo. The best Italian-Japanese crossover since Mario. 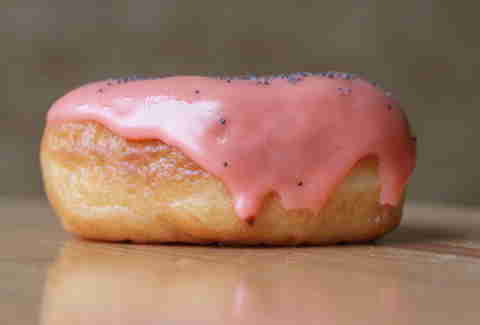 Blood orange icing, poppy seeds, donut. Don't eat one before your drug test, Elaine. 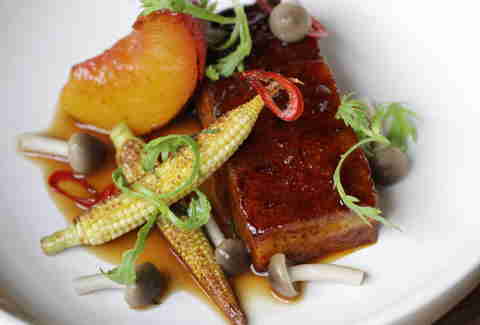 Crispy pork belly, roasted peach with brown sugar, natural jus, roasted baby corn with mint. The fanciest bacon you will ever lay your eyes on. 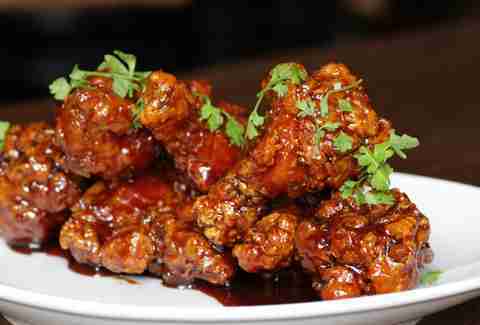 Twice-fried chicken wings, sweet/savory beer sauce. Recommended with: blue cheese, reckless disregard for cleanliness while eating. 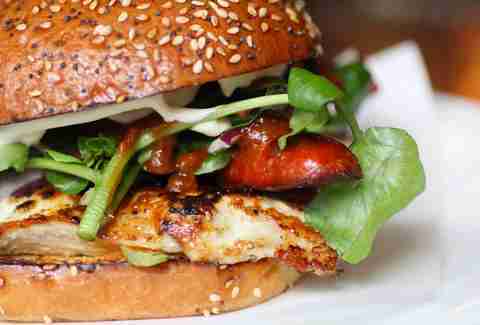 Chicken, spicy chorizo, aioli, chipotle ketchup, watercress, sesame bun. 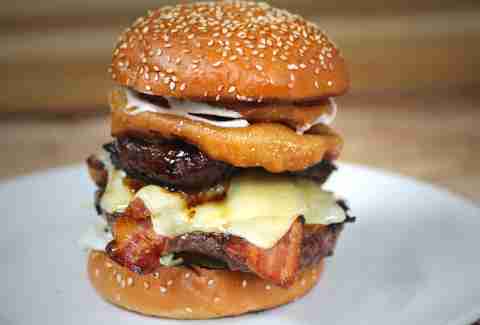 Those crazy Londoners will call anything a burger, but we'll allow this one because it's so damned delicious. Beef burger, short rib, bacon, cheese, onion rings, mushrooms, sesame bun. OK, so this one's an actual burger. Sorry for doubting you, London. 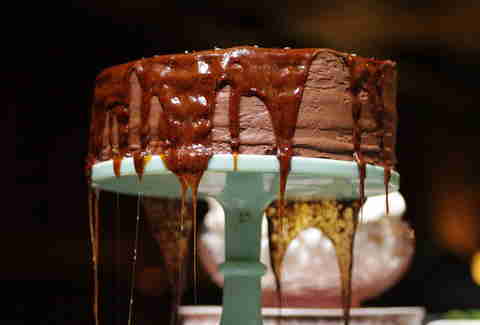 Layered sponge cake with chocolate buttercream and dripped hot caramel. Uh, yeah. This one's just not even fair. 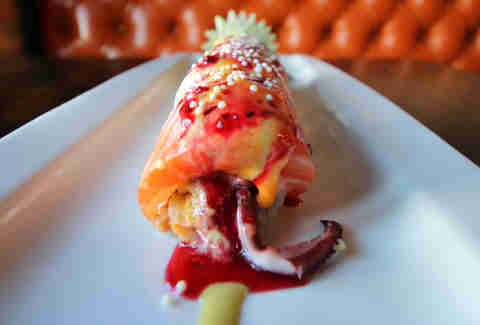 Octopus, crab meat, mango, avocado, spicy mayo, seared salmon, tuna, raspberry sauce, chili mayo. Kinda like an ocean reunion. With raspberries! 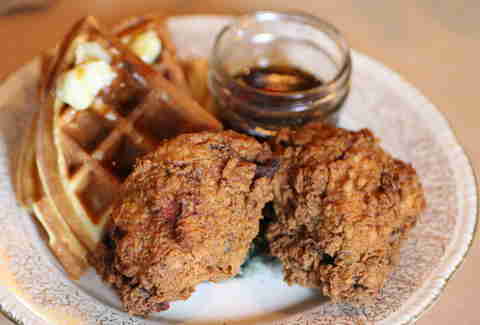 Sweet tea-brined fried chicken, buttery waffles, maple syrup. Damn, look at those thighs! 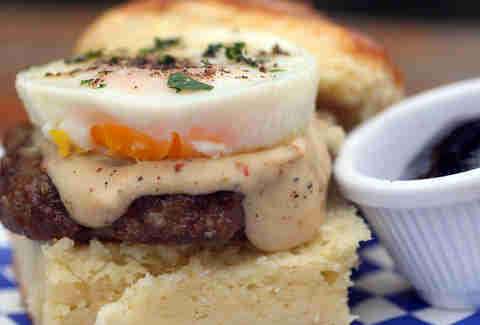 Biscuit, gravy, sausage, poached egg, Concord grape jelly. Poaching, in most cases, is wrong, but we'll allow it in this case. 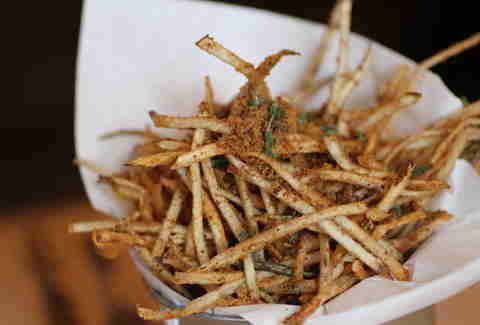 Shoestring fries, "jerky dust", herbs. The jerky dust is ground-up jerky. The herbs are still herbs. 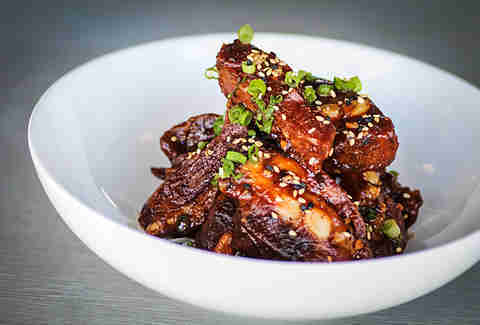 Plum-glazed pork ribs, sesame seeds, green onion. Rib tip of the hat to you, San Diego, for creating these. 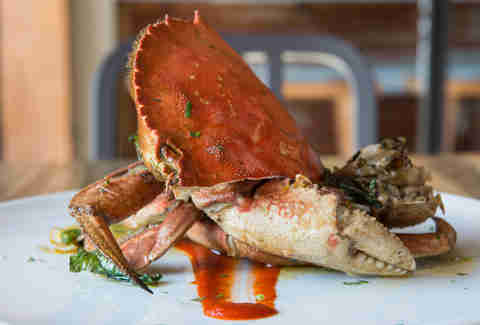 Dungeness crab, garlic, chili, basil, tomalley aioli, hot sauce. This is just half. That means you need to order two to get the full effect. 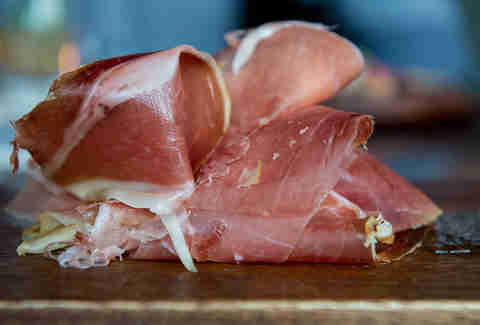 Virginia ham, malted mustard. 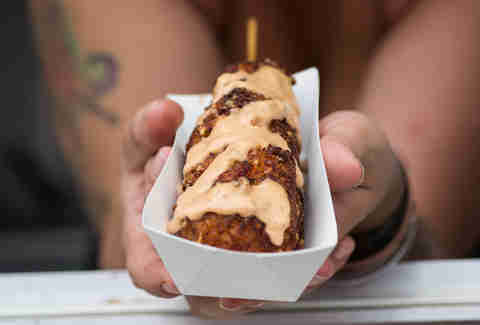 You'd better eat this one before Lady Gaga wears it. 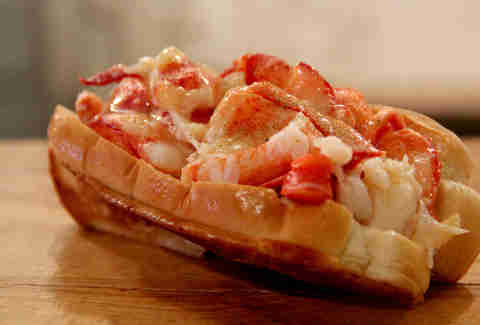 Lobster knuckle and claw meat, buttered bun, secret six-spice blend. While the spice blend may be a secret, we do have the scoop that this sandwich is incredibly beautiful. You're welcome. 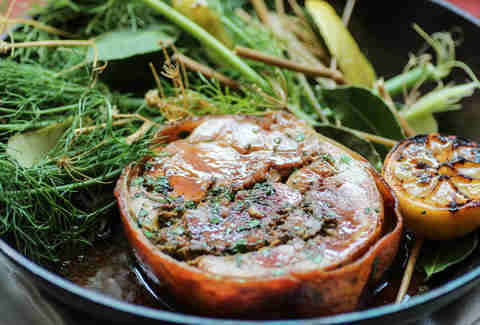 Four-day fennel-pollen-marinated porchetta, herbs. Three-day fennel-pollen-marinated porchetta is for squares. 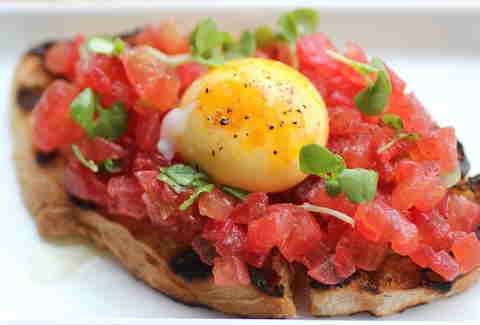 Grilled bread, tomato, egg yolk, microgreens. You can practically taste the egg by looking at that photo now, can't you? Cajun rice, chicken, Andouille sausage, green peppers, garlic, tomatoes, breading, remoulade sauce, stick. Please don't eat the stick. 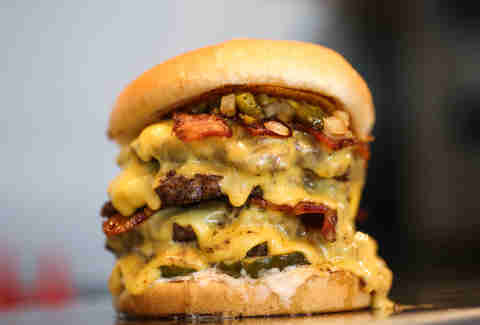 Four beef patties, grilled onions & jalapeños, six rashers of bacon, American cheese, mustard, special sauce, seedless bun. For when you ever want to scale a mountain of meat. Brioche dough, butter, vanilla pastry cream, cinnamon-sugar, chocolate frosting. This cronut clone was particularly photogenic, and that's why it made this list. Good on you, CroBrio! 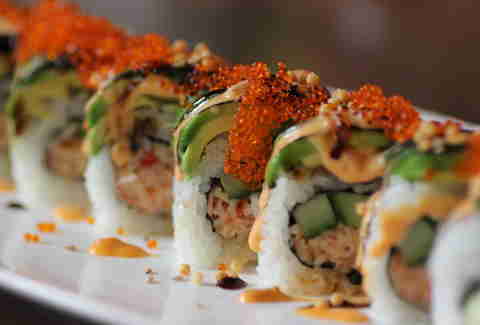 Spicy crab, avocado, cucumber, tobiko. You don't have to be an amateur entomologist (like us) to know that this sushi is awesome. 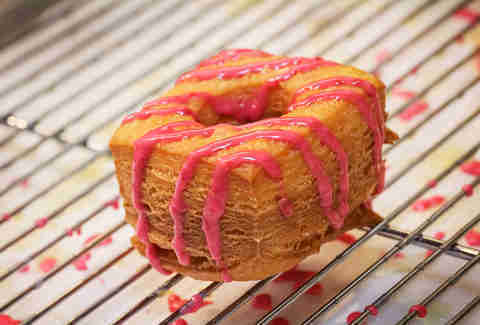 Croissant-style layered dough, cinnamon sugar, raspberry glaze. 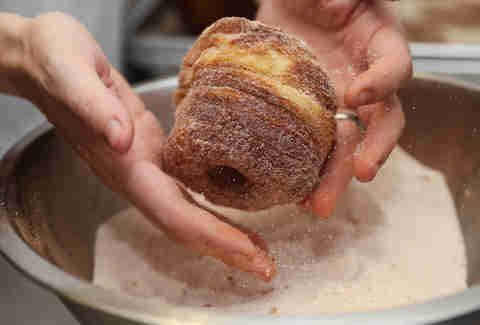 2013 was the Year of the Cronut, as you can plainly see. 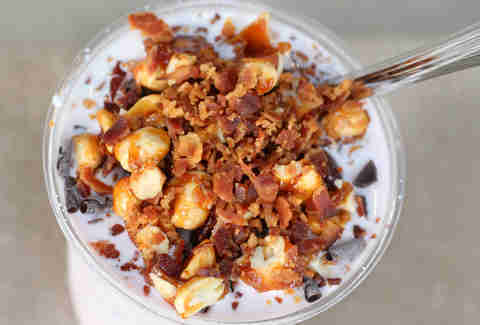 Vanilla ice cream, whiskey-soaked cherries, chocolate shavings, chocolate sauce, bacon brittle. Yeah. This exists. 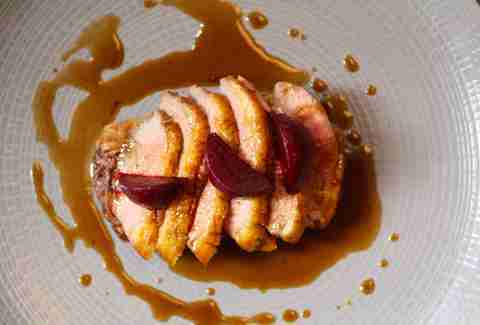 Roasted duck breast, rösti (Swiss potato pancake), beetroot, jus. Daffy? We're so sorry.